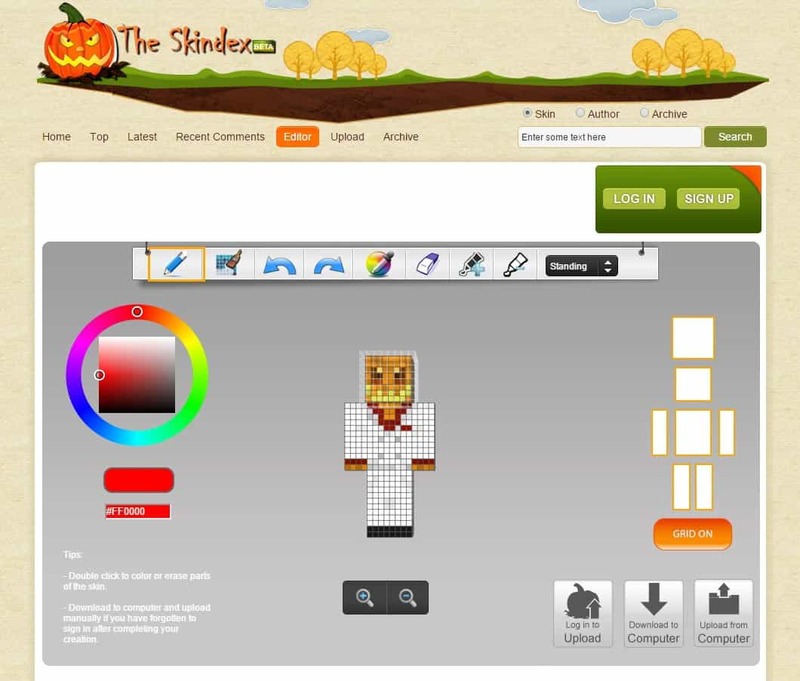 Download the reference skin from your Minecraft profile. 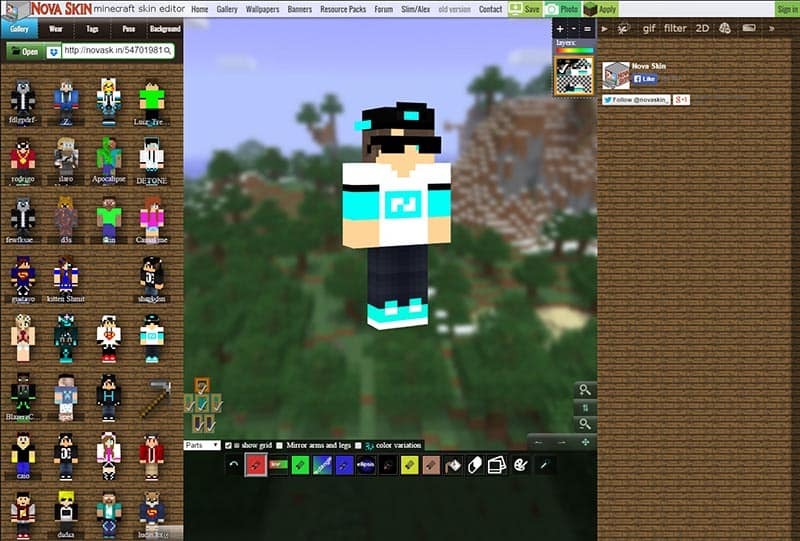 Log in and scroll down until you see a heading that says, “Change how you look in Minecraft.” Click the download the reference skin link and save the file. Open the file in your graphics editor of choice and zoom in. You’re editing pixels, after all, so the image is pretty small. The image may be in indexed color mode. You’ll need to change it to RGB. In Photoshop, select the Image >> Mode >> RGB Color menu item. Now you can draw your skin. This is the hard part, but it’s entirely up to you. When you’re done, save the image and go back to your profile page. Click the button that says “Choose File” and select the image file that you just saved. Click Upload and, voila, you have a new look in Minecraft. You’ll be the belle of the ball. Step 4 is where things get difficult. You’ve got to do all the drawing without much sense of what the finished product looks like. Fortunately, there’s a second way to create skins; use one of the many skin editors available for free. Other Minecraft fans have done a lot of the heavy lifting for you and created software that lets you draw directly on a 3-D image. Most of them run in your browser and have some additional features that make it easier to create your masterpiece. This editor has a lot of power. You draw everything directly on the 3-D object. You can hide individual body parts, target overlays like hats and jackets, and zoom and rotate the character to paint the perfect bald spot. It offers a few extra drawing tools – specific shapes, up to six saved colors, color palettes from other users, and optional mirrored drawing. You can even view and edit other people’s skins. You’ll need to sign in to their site before you can save any images, though. Help for the tool is pretty minimal, but the interface isn’t that complicated. This editor is a great beginner’s tool, but also caters to power users. It takes a layer-based approach, allowing you to add any number of pre-made and custom layers. You can build up a character piece by piece. If you want a scaly green thing with a Viking helmet and a Speedo, you can do that in a jiffy. The custom editor isn’t quite as nice as other editors, as you still draw on the flat texture, not the character object. Changes show up immediately on your little dude, but it still leaves a little guessing as to what your edits will look like. 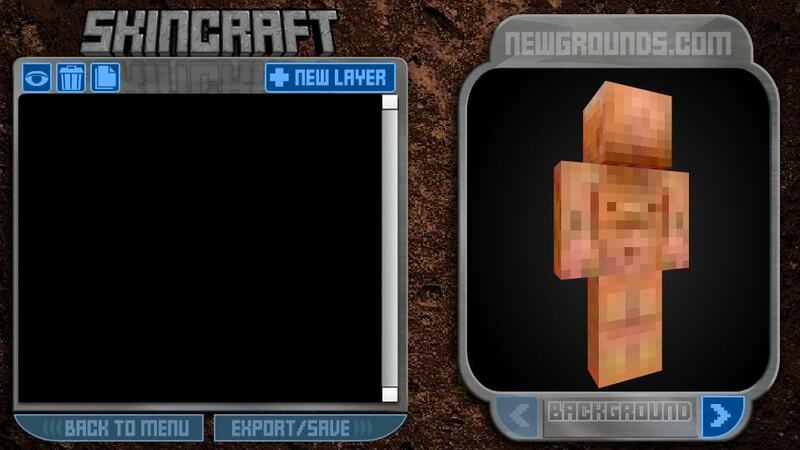 But Skincraft makes up for it by including pretty cool layer blending and blur options. This editor is pretty basic compared to the others. You can paint the character directly, as well as zoom, rotate, and show/hide individual parts, but that’s about it. It doesn’t have the overlay options that the Novaskin editor does and does nothing with layers. It does let you pose the character, so if it’s important for you to see how your skin looks on your guy mid-jump, then this gets the edge. Other than that, it’s only better than manually editing the file yourself. You’ve got a lot of options when it comes to customizing your character and the editing programs above make it pretty easy. Now you’ve got no excuse dressing like a noob in the game. Don’t forget you can check out and use some of the skins we have here!